Visit our anti-Bill C-51 campaign site here. Across Canada, alarms are being raised against Bill C-51, the so-called “Anti-Terrorism Act, 2015” which gives the Canadian state sweeping new powers to further criminalize public dissent. In the first place, it targets those critical of the corporate agenda of austerity, environmental destruction, and imperialist war. This dangerous Tory legislation would help further transform CSIS into a secret police force beyond the control of the public or even Parliament. The Communist Party of Canada warns that Bill C-51 cannot be “amended” or “improved”; it must be rejected by Parliament, and CSIS itself should be dismantled, not expanded. This Bill constitutes perhaps the most serious threat to free speech and civil liberties in Canada since the era of the War Measures Act, which was proclaimed by governments several times from World War One to the 1970s to suspend democratic rights, including mass incarcerations of targeted ethnic groups, Communists, trade union leaders and a broad range of democratic forces in Quebec, until it was finally repealed by Parliament in response to massive public pressure. Bill C-51’s alleged purpose is to protect Canadians from “terrorism”, but its true aim is to help the Conservative Party use fear and intimidation tactics to extend its political base in advance of the 2015 federal election. The underlying purpose is to limit civil, labour and democratic rights of all Canadian citizens and residents, and to expand the powers of an increasingly authoritarian state. Under this legislation, CSIS agents will be allowed to act against any perceived “threat to the security of Canada,” without a judicial warrant if they claim that their activities do not contravene Charter rights or the law. CSIS would be permitted to disrupt vaguely defined “radical websites”, and to apply for court orders to remove “terrorist propaganda” from the Internet. The Bill lowers the legal threshold to detain people without criminal charges, and expands the reach of the “no-fly list”. CSIS agents will be allowed to break into homes and offices, seize documents, remove whatever they find, install monitoring devices, or carry out any “dirty tricks” or disruptive activities which a judge agrees is “reasonable”. Since the government has declared that Canada is at war, there is every reason to believe that any judicial limits on these police powers will be minimal at best, and that these activities will be integrated with the CIA’s “black operations” around the world. Just as ominous, there will be no mechanism for Canadians to even monitor CSIS, leaving only the PMO and a tiny clique of powerless and complicit officials with knowledge of its actions. Section 16 of C-51 prohibits “advocating and promoting terrorism”, raising a wide range of unanswered questions. 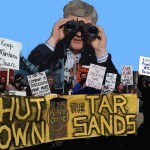 For example, Public Safety Minister Blaney has refused to give a direct response in Parliament or to the media regarding non-violent civil disobedience protests against the extraction and export of tar sands bitumen. The clear implication of Minister Blaney’s comments is that any protests directed against the energy industry are by definition potentially dangerous, and could fall under the general umbrella of “terrorist” activity. Similarly, Conservative cabinet ministers repeatedly slander the broadly-supported movements which oppose Israel’s apartheid-style occupation of Palestinian territories – such as the Boycott, Disinvestment and Sanctions campaign – in effect branding these movements as targets of CSIS actions. Since coming to power in 2006, the Harper government has engaged in massive surveillance against indigenous people’s movements, and has frequently used back-to-work legislation against unions under federal jurisdiction, claiming that strikes at Air Canada, Canada Post, and elsewhere constituted a threat to the economy. Now, Bill C-51 will criminalize actions which “interfere with the ability of the Canadian government to maintain economic or fiscal stability”, an obvious threat against both the labour movement and the right to strike, and indeed any movement which resists the agenda of the banks and corporations. Trade unions and Aboriginal peoples will be a major focus of the beefed-up CSIS, just as the RCMP was used for decades by federal and provincial governments to break strikes and target Aboriginal activists. In other words, the Harper Conservatives are providing CSIS with powers going far beyond those which were stripped from the RCMP over 30 years ago as a result of its illegal activities such as barn-burning in Quebec and spying on CUPW – and at the same time the Tories are implicitly setting the political agenda for this new secret police operation. A growing chorus of criticism is emerging, including by some media outlets and civil liberties groups. The Green Party leader, MP Elizabeth May, has condemned C-51 as so “overbroad” that it “could apply to anything”. After some wait, the NDP have opposed Bill C-51. This is welcome; however their reasoning that the Bill “goes too far“ understates the dangers to civil, labour and democratic rights. While raising some questions about the lack of public oversight of CSIS, the Liberals and Bloc Québécois are supporting the legislation. The Communist Party will do everything in our power to help defeat Bill C-51. We urge the labour and democratic movements, environmental groups, Aboriginal peoples, the Palestine solidarity and anti-war movements, civil liberties groups, and all those who care about civil, labour and democratic rights, to help build a powerful, mass, united campaign against this police state legislation. Such a broad-based fight can win, by mobilizing public opposition right across the country! On the expanding “War on terror”: unite to defend democracy, peace and equality Dîtes au parlement qu’il doit défaire le projet de loi d’État policier C-51 !